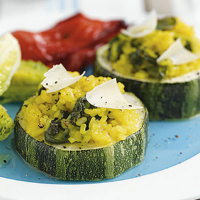 Try marrow slices filled with ready-to-cook risotto, fresh leafy spinach and Italian cheese. Prepare the marrow by trimming the ends then cutting into about 8 slices, each 2cm-3cm thick. Remove the seeds by cutting a circular piece out of the centre of each slice. Place the slices in a steamer, cover and leave to one side. Preheat the oven to 200°C, gas mark 6. Place the risotto mix in a medium-sized pan with 600ml cold water. Bring to the boil, place the steamer with the marrow slices on top and simmer for about 10 minutes, stirring occasionally, until the rice is just tender but there is a little liquid remaining, and the marrow slices have softened slightly. Alternatively, lightly cook the marrow slices in the microwave on medium power for 1-2 minutes. Place the softened marrow slices on a baking sheet lined with foil then parchment paper. Using a peeler, make shavings from a quarter of the cheese, then grate the remainder. Stir the grated cheese and freshly ground black pepper into the risotto. Mix in the spinach and cook gently until it has wilted. Spoon the risotto onto the marrow slices, filling the centres. Cover the baking sheet loosely with foil and seal around the edges. Bake for 20-30 minutes, until the marrow is tender but the rice is not overcooked. Serve, drizzled with the olive oil, and sprinkled with cracked black pepper and the cheese shavings. Eat with roasted Romano red peppers and a fresh salad of crispy Little Gem lettuce hearts dressed in olive oil. Part-cooking the marrow over the rice means a shorter final cooking time in the oven. This will prevent the rice from drying out. This dish calls for a rich and spicy red full of juicy raspberry and plum fruit.